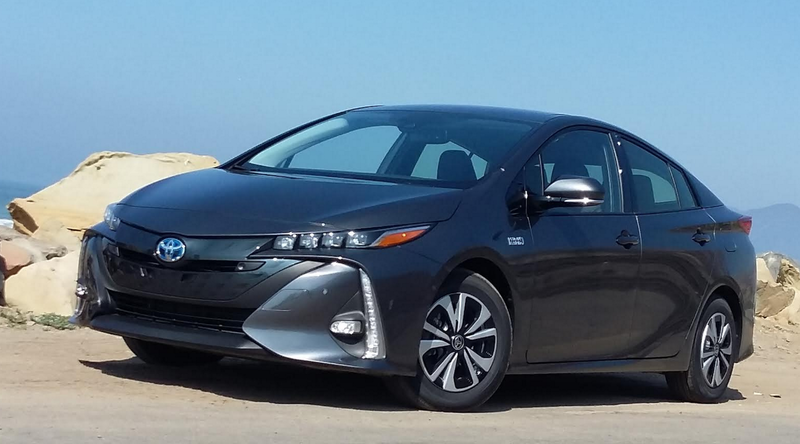 A plug-in version of the Toyota Prius returns for 2017 as the Prius Prime. It boasts unique styling and offers up to 25 miles of electric-only range, after which it carries on as a regular hybrid — for a total of up to 640 miles between fill-ups. When the Toyota Prius was redesigned last year, its Plug-in sibling was notably absent from the lineup. But a plug-in version returns for 2017 as the heavily updated Prius Prime, and it stands as a truly viable alternative to the “normal” Prius. Toyota’s Prius has long been wildly popular; the plug-in version – introduced for 2012 – not so much. And it isn’t difficult to understand why. For its roughly $4000 surcharge (about $1500 if the buyer was eligible for the $2500 federal tax credit), the Plug-in version of the Prius offered but an 11-mile electric-only range – and to get that, of course, you had to go to the trouble of plugging it in. Yet even that was a bit of an overstatement, as anything but very modest acceleration prompted the gas engine to kick on to help out. And after that 11 miles was up, it returned roughly the same fuel economy as the regular Prius. Furthermore, it wasn’t offered in all states, though buyers in California liked it because it was allowed to use the car-pool lanes where the regular Prius no longer offered that benefit. The Prime is four inches longer than a regular Prius, all added aft of the rear wheels to allow more space for the larger battery. Tail-end styling is also altered, and includes a unique compound-curve rear window. In many ways, the new Prius Prime adds to the Plug-in’s pluses without suffering as many minuses. And though it looks similar to the Prius on which it’s based, the Prime has unique styling that makes it instantly identifiable – at least to those in the know (which will now include you). First, the all-electric range has been more than doubled to 25 miles. That’s mostly because the battery is twice as powerful (8.8 kWh vs. 4.4), but increased efficiency also takes some credit. It’s part of what gives the Prime a remarkable EPA MPGe rating (given to any plug-in vehicle) of 133, with “regular” fuel economy rated at 55 city/53 highway/54 combined – actually a couple miles per gallon better than the regular Prius. Maximum range between fill-ups is listed as an equally impressive 640 miles. Second, while both the previous Plug-in and the Prime use two motor/generator units (a motor and a generator being virtually identical mechanically), the Plug-in used one of its motors for driving the car, the other only for starting the gas engine. By contrast, the Prime uses both motors to help power the car. 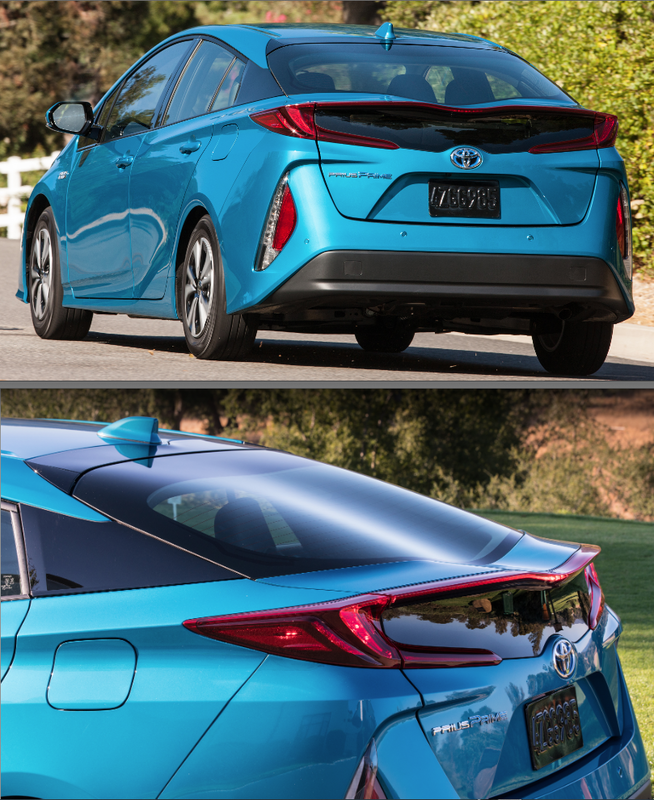 As a result, the Prime is not only quicker (Toyota says by about a second over the regular Prius to 35 mph), but it can accelerate more quickly without having to kick in the gas engine to help. Furthermore, the cost is not only “less prohibitive,” but actually a relative bargain. There are three trim levels available – Plus, Premium, and Advanced – with the base Plus starting at $27,965 including destination. And with its larger battery, the Prime is eligible for a $4500 federal tax credit (vs. the old Plug-in’s $2500), which brings its net cost down to just $23,465. In an odd turn of events, that leaves the Prime potentially costing less than the base Prius – by a rather substantial $2000. 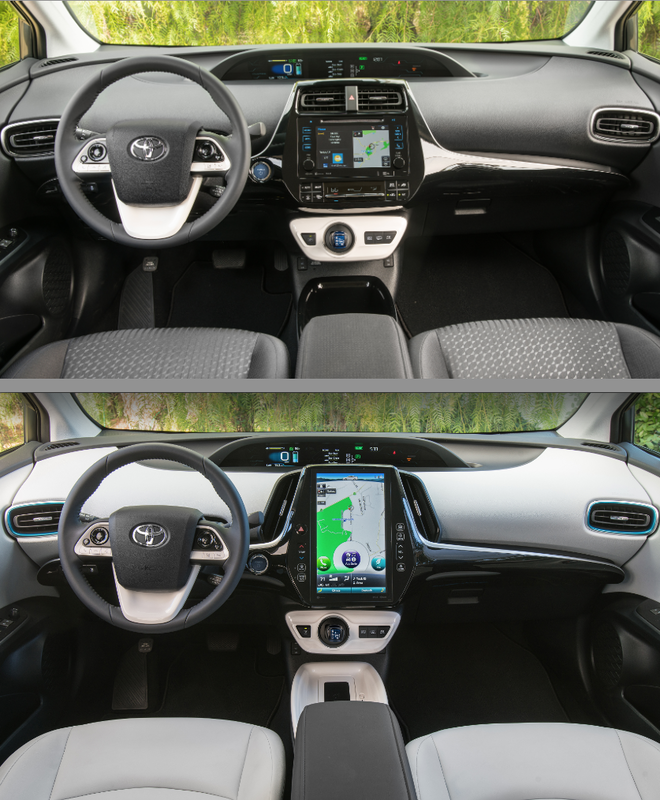 The base Plus trim level (top) is fitted with a 7-inch touchscreen and some knobs and flippers for audio and climate adjustments. Premium and Advance (bottom) have a large, 11.6-inch touchscreen and some virtual buttons. Speaking of trim levels, even the base Plus comes very well equipped, with some unusual standard features including navigation system, rearview camera, heated front seats, keyless entry and starting, and heated outside mirrors. It also comes with Toyota’s Safety Sense P suite of safety features, including forward collision warning with pedestrian detection, lane-departure warning and mitigation, adaptive cruise control, and automatic high beams. Added to the $29,665 Premium are such features as SofTex (leather-like) seat trim, 8-way power driver seat with lumbar adjustment, 11.6-inch touchscreen, and Qi-compatible wireless device charging. Moving to the top-line $33,965 Advanced nets you a heated steering wheel, rain-sensing wipers, a remote-controlled climate system, auto-dimming rearview mirror with HomeLink, head-up display, park assist, and blind-spot monitor with rear cross-traffic alert and emergency notification and assistance. With all these advantages, it would be a shame to restrict Prius Prime sales only to certain states, so the Prime will be offered in all 50. Sales are expected to commence late in 2016. So those are the advantages. But they don’t come completely without sacrifices. To squeeze in the larger battery, not only has the back end of the Prime been extended by about four inches, but the rear seat will only accommodate two passengers rather than the Prius’s three (as the rear-seat’s center-console area has been sacrificed for the larger battery), meaning the Prime is a 4-passenger car rather than a 5-passenger. Also, the floor of the cargo area has been raised (likewise to allow for more battery space), which cuts the cargo capacity by about five cubic feet from that of the regular Prius. But that’s about it. In most other ways, the Prime is very close to its Prius sibling, which is a pretty great place to be. Although not quite “quick” in the established sense, the Prime never feels underpowered, and is actually impressively responsive in around-town driving. That’s mostly thanks to its two electric motors, which produce power almost instantly when you hit the gas pedal, whereas a gas engine – or more specifically, the associated “kickdown” of the transmission – often hesitates a beat or two before real power arrives. 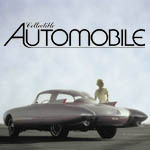 While that provides a somewhat sporty feel, the rest of the dynamics are less stimulating. The tires on all models are rather narrow 15-inchers with fairly tall sidewalls, which tends to provide ride comfort at the expense of handling response. And indeed, the Prime seemed to ride quite smoothly – albeit with some bobbing over swells – though our California preview route didn’t provide much in the way of challenging surfaces. Body lean in fast turns is fairly modest, but the steering feels light and video-game numb – which is OK in most normal driving, but hardly beneficial to “road feel” in the twisties. Inside the Prime, there’s a good amount of room up front, but while legroom is fine in the rear (my 5’9 frame had enough legroom even behind a fully rearward front seat), headroom might get tight for those over about 5’11. Visibility is only restricted to the rear corners (the standard rearview camera helps here), but oddly, the sunvisor leaves about a third of the side window uncovered when swung to the side because it doesn’t extend. Most “touched” surfaces are lightly padded, and if you like black-and-white trim, you’re in luck. Interior storage space is perhaps a bit above average and certainly adequate. The base Prime Plus comes with a 7-inch touchscreen augmented by volume and tuning knobs. Climate controls consist of flipper levers to adjust temperature, fan speed, and mode. By contrast, Premium and Advance have a large, vertically oriented 11.6-inch touchscreen where everything is done through the screen or repetitive-step virtual pushbuttons; there are no knobs or flippers. Though this all comes off as appropriately “techy,” we found the base system easier to use. Prime’s cargo floor is raised to accommodate the larger battery — leaving a 3-inch step down to the folded rear seat back — but the area is wide at the rear and includes some under-floor storage space. Despite losing some space to the larger battery, cargo room remains quite good. The higher floor steals some of it and results in a 3-inch drop down to the folded rear seatbacks, but the area is wide at the rear with an under-floor bin beneath. 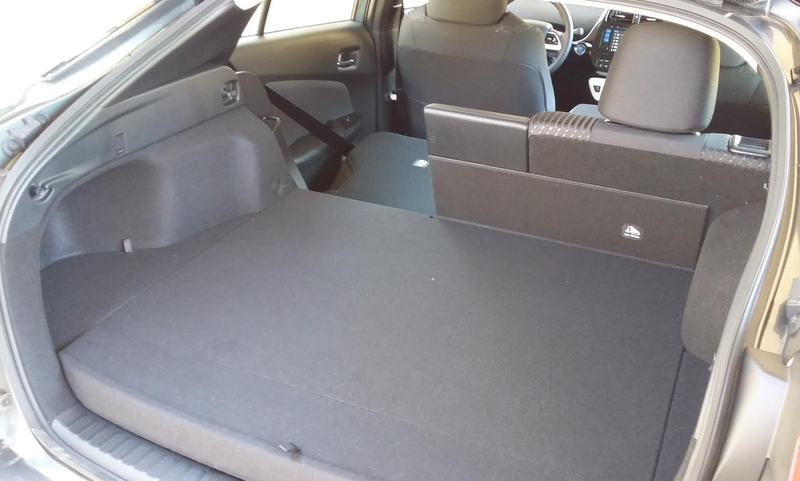 In any case, there’s still more usable (or at least, expandable) space than in any hybrid sedan, which typically sacrifices some or all of its “pass-through” capability by placing the battery up against the back of the trunk wall. So okay, you lose some trunk space and are limited to four passengers. But you gain more ability to drive on all-electric power – which decreases your overall running costs – and gain some added scoot as well. And when you add in the fact that the Prime actually costs less than a regular Prius if you can take the tax credit (and in California, the ability to use the car-pool lane) the Prime looks to be the strongest competitor the Prius has ever had. Seems there’s something to be said for a little sibling rivalry. All Prius Prime trim levels ride on 15-inch wheels — small in this day and age — fitted with aerodynamic wheel covers. As far as the wind is concerned, the Prime is one of the slipperiest cars on the road. Written by: Rick Cotta on October 4, 2016.on February 7, 2017.